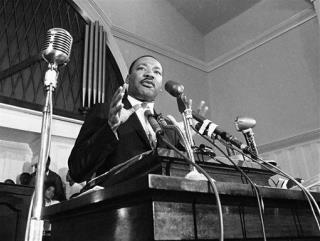 (Newser) – Dr. Martin Luther King Jr. talks about the civil rights movement, nonviolence, and his work in Africa in a newly discovered audio interview found in a Chattanooga attic. Stephon Tull found the audio reel labeled "Dr. King interview, Dec. 21, 1960" in his father's house, borrowed a reel-to-reel player, and heard his father interviewing King. "No words can describe. I couldn't believe it," Tull tells the AP. "I found ... a lost part of history." Keep looking, Maybe the Lindbergh baby is up there too. He really did not delivery his people to true freedom. Most of them are enslaved to the US welfare system. They live in government owned projects, HUD owned homes, and HUD owned retirement centers. They visit the grocery store on the 1st to buy up to $1200 in government provided food allotments. They only expression of freedom they do have is to go to the ballot box to be sure they keep the people in office who make all their entitlements possible. They think in their minds that this is freedom but in reality its the worst form of slavery that King fought to remove. He utterly failed.